Every year, the President of the European Commission presents his speech on the state of the Union. Year after year, this speech offers a compilation of everything that should not be done when speaking in public. Let’s take advantage of it to revise the 5 canons of rhetoric: invention, arrangement, style, memory and performance. Invention is the stage where the speaker collects the material of his speech. The question one should then have in mind is: what should I say given the situation, the audience and the time constraints? In this case, Jean-Claude Juncker speaks in a Europe in crisis (terrorism, Brexit, massive influx of migrants, the rise of populism and Euro-skepticism). He addressed these problems pretty well. He even took a stand on sensitive issues (he notably condemned the authoritarian drift in Turkey and advocated for a UE president with a more executive role). That said, those few brave statements are drowned in a flow of facts, proposals and results without interest to the general public. Was this really the time and place to showcase the virtues of the “new EU framework for investment review” or to announce the opening of trade negotiations with Australia and New Zealand? 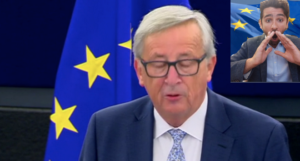 Admittedly, Juncker seems to have incorporated the function of the introduction: “When I appeared before you last year at the same time, my task was, in a way, easier.” These words instill gravity and you want to know more. The serious problem does not come either from the introduction or from the conclusion. It is between the two that things go wrong: it is so bushy, so monotone that I had to read the transcription to understand the structure. If a student does that to me, it’s zero. Style is a fundamental element of the oral speech. One must understand that style, in rhetoric, is not about sounding pretty. It is through style that we can truly create an event, going beyond the informative function of discourse to federate, exalt or dispose to action. Let us see an example of Mr. Juncker’s lack of style. Absolutely, I am convinced, I am about to cheer. Are you kidding me? Is that all that you found Jean-Claude? Equality before breaded fish and cocoa? Yet you had a choice, Jean-Claude, you had an ocean of rhetorical possibilities. This choice reveals you as a speaker. Concretely, a good orator should have a sufficient command of his material to focus on the audience rather than on the text. You should be ashamed of Jean-Claude. Performance, finally, is the most important canon. Keep this in mind: a speaker who has not prepared anything but who offers his audience a good time fills his role a thousand times better than a speaker who annoys everyone by reading a magnificently prepared speech. Jean-Claude Juncker speaks while asleep. Literally. This could be funny but, in truth, it’s sad. Take two seconds to picture the grotesque of the situation: a man gathers important people, in a prestigious place, on a given date, to deliver a speech. However, when the time comes, he does not provide any added value compared to the individual reading of a written document. These people deserve better than that. We deserve better than that. For, ultimately, what are we talking about? We are talking about one of the most beautiful project in the history of mankind. I weigh my words. We are talking about a political project that, until very recently, has replaced poverty by wealth, arbitrariness by law, war by peace. Our Union deserves a better speech. Next time, get some help!